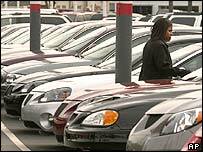 US carmakers have seen sales slump in June with GM and Ford both posting double-digit declines. The slowdown - triggered in part by a lack of fresh incentives in an industry now wedded to sweeteners - followed a blistering pace for sales in May. GM sales were down 15.5% from June 2003, with Ford sales down 11.2%. But Japanese and other Asian firms made significant gains, cementing their position as the pacemakers in the US automobile market. Toyota sales were up 5.9%, giving it a 11.9% share of the overall market, with Nissan sales growing 9% and Korean carmaker Hyundai shooting up 20.1%. Among the European vendors, BMW had a solid month with sales up 7.9%, but Volkswagen found itself sharing the fate of GM with a slide of 15.9%. The sales for the year to June showed less drastic declines for the home-grown marques. Ford was off 4.1%, GM down just 0.3% and DaimlerChrysler increased sales by 1.6%. But the Asian vendors' gains for the 12 months to June were striking: Toyota up 10.5% and Nissan streaking ahead by 24.7%. And the weak market meant June sales were down 6% on a seasonally adjusted basis to the equivalent of 15.4 million units in a year - the worst performance since summer 1998. Stockpiles at the big Detroit motor firms is building up - even though DaimlerChrysler evaded the fate of its US peers with a narrow gain in sales. That could mean renewed effort on the part of car firms to ramp up the cut-price deals and cheap finance offers for July and August. One culprit for the June slowdown, analysts said, was the lack of fresh incentives - the upsurge in started after the 9/11 attacks. "There's no question that there's some payback from the really aggressive incentive programme," said Joe Phillippi, consultant and ex-Wall Street analyst. "As the result of ever more aggressive incentives... sooner or later you reach some levels of saturation." The sales slide is accentuating the demand for cars from Asian vendors. One sign of the popularity is that Toyota is having trouble producing enough of its iconic Prius hybrid - a car which runs both on petrol and electricity. The company is now planning to turn a second Japanese factory over to building the Prius for the US market.